SCOTTSDALE, Arizona – September 27, 2016 – Barrett-Jackson, The World’s Greatest Collector Car Auction®, will auction 150 vehicles at No Reserve from the world-class Charlie Thomas Collection between the Las Vegas and Scottsdale auctions. A small sample of the quality vehicles in this collection will be showcased at the 9th Annual Las Vegas Auction from Oct. 13-15, 2016, at the Mandalay Bay Resort and Casino. Six vehicles will cross the auction block and an additional six will be on display in the Barrett-Jackson Future Events booth. 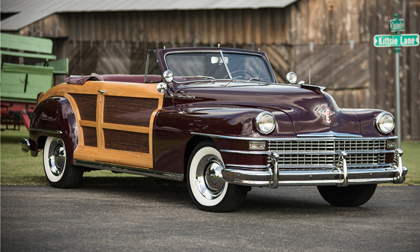 A great example of the quality available is represented by the 1946 Chrysler Town & Country Convertible selling in Las Vegas. The Royal Maroon Chrysler has had a frame-off professional restoration and a 323ci Straight 8-cylinder engine backed by a Fluid Drive transmission powers the car. Also from this era is a black 1940 Cadillac Series 62 with red interior and a large 346ci V8 teamed with a standard transmission. Another American luxury vehicle from this collection in Vegas will be a Presidential Black 1958 Lincoln Continental Mark III Convertible. Rated at 375hp, under the hood is a 430ci V8 with 4-barrel carburetor and the luxuries abound include power steering, power brakes, power windows, power seat, power self-latching top and leather seats. Rounding out the selection of vehicles from the collection selling in Las Vegas is a 1957 Chevrolet Bel Air Convertible, a 1959 Mercedes-Benz 190SL and a beautiful red 1952 Nash-Healey Roadster powered by the “Le Mans Dual Jetfire” inline-6 with aluminum cylinder head and dual carburetors. Established in 1971 and headquartered in Scottsdale, Arizona, Barrett-Jackson, The World’sGreatest Collector Car Auctions®, is the leader in collector car auctions and automotive lifestyle events. The company produces auctions in Scottsdale, Arizona; Palm Beach, Florida; at Mohegan Sun in Connecticut, and Las Vegas, Nevada. With broadcast partners Velocity and Discovery Channel, Barrett-Jackson will feature live television coverage in 2016, including broadcasts in over 100 countries internationally. Barrett-Jackson also endorses a one-of-a-kind collector car insurance for collector vehicles and other valued belongings. For more information about Barrett-Jackson, visit http://www.barrett-jackson.com, or call 480-421-6694.